FRONT ROW (seated) L, to R - James Cheevers, Matthew Ronan, John O'Flynn, Stephen Ryan, Robert Comerford. 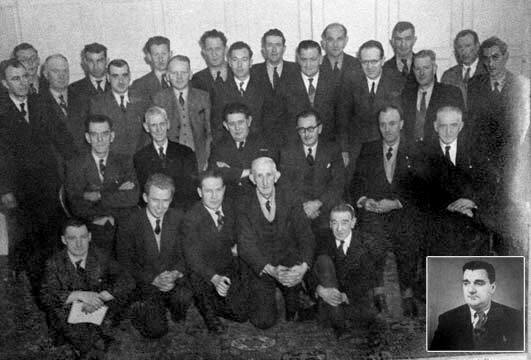 SECOND ROW (seated) L, to R- James Carroll, James Mason, Gerard Doyle (General Secretary) Leo Crawford (President) William Lumsden, Robert Callanan. THIRD ROW (Standing) L, to R- Michael Gullane, James McCabe, John Kenna, Patrick Cheasty, John Hetherington, Patrick A Griffin, Bertie Curtin, WJ Sherman, Charles Mullholland, Fourth Row L, to R - Ted Prendergast, William Deegan, William Coogan, Francis Mooney, James Murray, John McGee, Edward O'Brien, Donal O'Reilly. On the 13th of September 1893 the Regular Stucco Plasterers' Trade Union of the city of Dublin registered under the Law with the Registrar of Friendly Societies. The union met in the Trade hall in Capel Street, Dublin, the premises of the Dublin Trades Council. For over one hundred years the Dublin Plasterers have maintained a continuous and independent existence as a registered trade union with slight changes to its name. These name changes have reflected the union's growth from a small Dublin based society of around 250 plasterers to the national union, with around 1000 registered members organised in countrywide branches, and organises not only plasterers but, tilers, slaters, and similar trades included in the name by which we are known today, the Operative Plasterers' & Allied Trades Society of Ireland. This unbroken history of over 100 years of Trade Union registration supports the plasterers' claim to be the longest surviving autonomous union in Ireland. A craft organisation among Dublin's working plasterers' can be traced much further back. The rule book of 1894 and the membership card of OPATSI today display both the coat of arms of the city of Dublin Guild of bricklayers and carpenters, and the date, 1670. Dublin plasterers' claim a direct descent from this guild.